Full face masks are designed to provide continuous airflow to prevent soft throat tissue from collapsing and blocking the air passage. They are intended for patients that suffer from sleep apnea which is characterized with frequent berating pauses. Full face masks offer complete comfort, good seal and are easy to use. Majority of sleep apnea patients have hard time adjusting to these Cpap devices, but once they do, the results are excellent. The main reason patients have hard time wearing full face masks is the fact that these devices cover almost the whole face (nose and mouth area) which is why many feel claustrophobic. 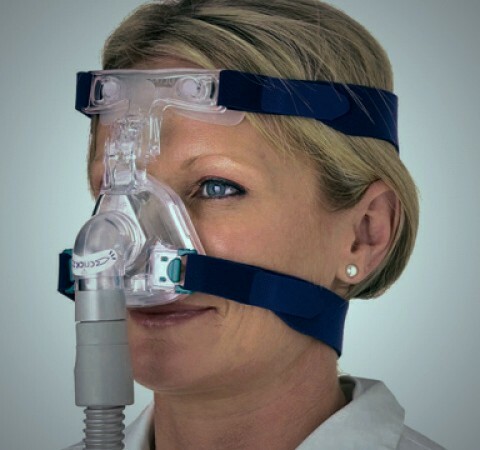 Full face masks are normally prescribed to sleep apnea patients who breathe through their mouth during sleep and also haven’t had any success with other simpler in design Cpap devices, such as the nasal mask and chinstraps. Also, for those who have chronic sinus, doctors prescribe full face masks as these Cpap devices guarantee constant and continual air flow which is crucial for ensuring a normal breathing pattern. Doctors even recommend the use of full face masks if congested due to common cold or seasonal allergies. Aside from regular usage, proper fit is essential. The best way to properly fit a full face mask is by putting the mask on while the straps are as loose as possible. Starts with the forehead strap first. Put the strap over your head, tighten it and then move to the next attachment. This will allow the nasal-mouth cushion to fit correctly and create a perfect seal which will prevent mask leaks even when moving. Always first ensure the mask is in place before tightening the straps. Tend not to over tighten the straps as it will leave you with red marks on your face and can cause mask leaks. All full face masks come with a chin strap. It is up to you whether you want to use it. In fact, doctors advise patients not to use the chin strap with their full face masks since it creates discomfort. Full face masks although powerful are very delicate which is why regular care is essential for impeccable performance. Regular maintenance includes daily washes, using water and very gentle cleaning detergent, and air drying. Make sure you do not wash your full face masks with antibacterial soap as it can damage the silicone of the mask cushion. It can also leave residue on the mask cushion what will diminish the sealing power of the mask. Always clean the full face masks after each use. This will ensure long life and superior performance. To ensure long life of full face masks, it is important to regularly replace different mask parts. For example, mask cushion should be replaced every three months, filters every six months, etc.